Slime molds are among the world’s strangest organisms. Long mistaken for fungi, they are now classed as a type of amoeba. As single-celled organisms, they have neither neurons nor brains. 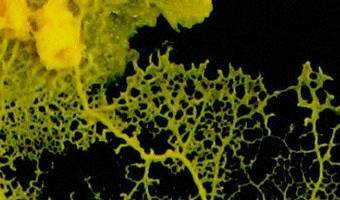 Yet for about a decade, scientists have debated whether slime molds have the capacity to learn about their environments and adjust their behavior accordingly. Quanta Magazine About Original story reprinted with permission from Quanta Magazine, an editorially independent publication of the Simons Foundation whose mission is to enhance public understanding of science by covering research developments and trends in mathematics and the physical and life sciences. For Audrey Dussutour, a biologist at France’s National Center for Scientific Research and a team leader at the Research Center on Animal Cognition at Université Paul Sabatier in Toulouse, that debate is over. Her group not only taught slime molds to ignore noxious substances that they would normally avoid, but demonstrated … [Read more...] about Slime Molds Remember—But Do They Learn?